When you’re moving around with your walker, whether in your home or out and about, it’s wise to have storage space to carry items. This can be useful not only for things such as a wallet or phone but for many elderly, it’s also helpful if you need to have certain medications on hand or have an oxygen tank to take with you. We’ve selected our five favorite bags, baskets, tote bags, and carry bags for walkers and rolling walkers. 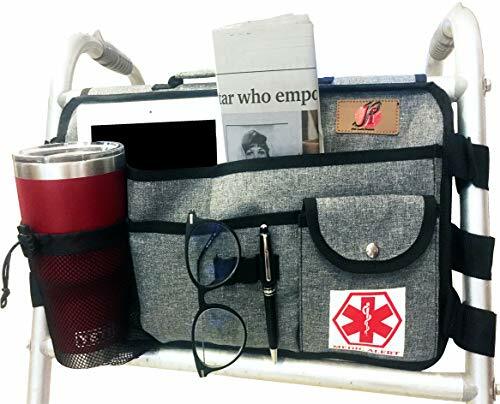 The medical alert pouch makes this bag ideal for seniors with medication or diabetic supplies, and we love the cup holder, too. The double-sided P & F Walker Bag is convenience meets organization. With a cup holder that works well for either a bottle of water, juice, thermos or travel mug, you can take medications or have your coffee with you wherever you go with your walker. We love that this bag not only offers several pockets but also has a medical alert closing pouch in case of emergency. This is smart for storage of pill bottles, diabetic supplies, or other medical items that might be needed even if a stranger or first responder to must find them quickly. 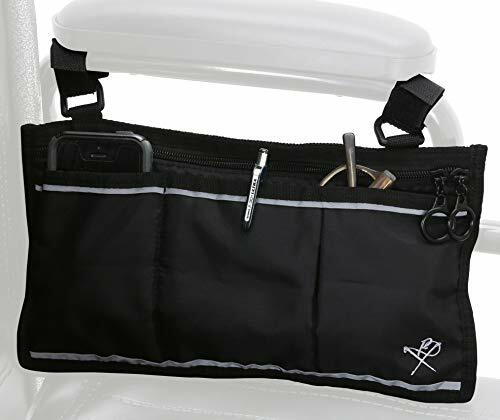 This bag also has a keychain clip, three pen holders, and a carrying handle at the top if you decide to remove it from your walker. With six Velcro straps, not only attaches easily but can be adjusted to suit your rollator or walker size. This is our favorite basket because of the exceptional price, outstanding ratings, and removable cup holder and liner for the bottom. 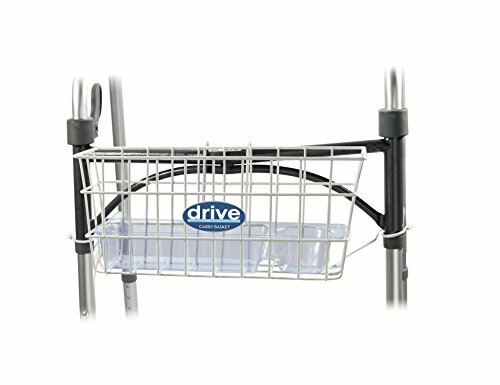 The Drive Medical Walker Basket is an ideal blend of the open, non-fabric design of a basket with the security of a tray bottom. This basket is not only affordable, but it also features a removable plastic cup holder and tray bottom to prevent essential items from falling through the wires. We love this for seniors who don’t want to worry about spills on fabric bags but still need a basket for carrying a few items here and there. This makes it an exceptional option for use inside nursing homes or assisted living centers, where elderly might need to move around with a drink and smaller objects, but don’t necessarily need a full tote bag. Don’t be fooled by the wire design of this basket—it can hold a decent amount of weight! This well-rated basket is sturdy, durable, and easy to clean. Moreover, if you prefer to use it without the cup holder or liner, they can be removed immediately. With fun patterns to select from, secure clip attachments and interior organization, this is our favorite tote bag. The RMS Water Resistant Tote Bag is excellent for seniors who like the idea of walker tote bags or totes for rolling walkers, but need a secure attachment. We love this tote for those who want adjustable, secure clips rather than Velcro straps. If you need to carry a more substantial item such as an oxygen tank and don’t want to worry about the straps of your bag coming undone, this is a fantastic option. This tote bag has a zippered front pocket and convenient organization for cards, ID, and keys inside the main pouch. The adjustable straps make it a nearly universal walker or rollator tote bag. Additionally, it comes in four colors/patterns. So, you can decide if you want something more fun or more neutral. The fabric is also water-resistant and cleans like a breeze. We love the padded shoulder strap of this bag for both walker or purse type of use. The Vive Rollator Bag is ideal for strapping on the front bar of your rolling walker and then taking it off to carry like a handbag or carry bag if you so choose. 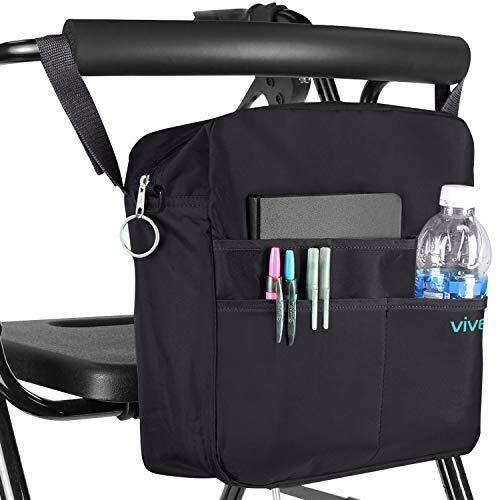 The structured design of this bag offers an easy to organize form for books, tablets, water bottles, tanks, and more. 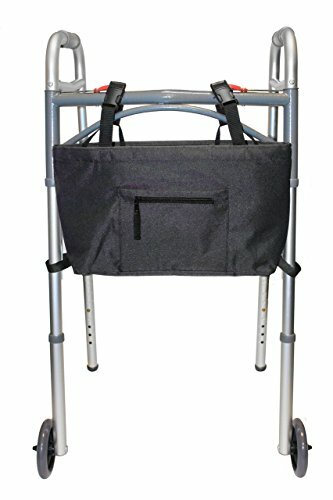 This is more ideal for elderly who want a rolling walker bag that they can also remove frequently to carry. The black version has a sleek, professional look, while the two patterned options offer a vibrant style choice. The shoulder strap has light padding for comfort. This bag is designed a bit more for smaller or flatter items rather than large, bulkier supplies. So, we like this carry bag for those with a bit more mobility and less need for any larger equipment to haul around. The reflective strip makes this ideal for elderly who might use outdoors at night, and the shorter straps are designed for rollators. The Pembrook Wheelchair Side Bag is a model with a slim design and five pockets for organization. This bag fits most wheelchairs, standard walkers, rolling walkers, and scooters. We like the zipper closure main pouch and the privacy and organization of the various pockets. The shorter Velcro straps (as opposed to a long-hanging shoulder strap) make this ideal for the movement of walkers and rollators. They’re designed to fit around most front lumbar support bars on rolling walkers. These shorter straps will prevent excessive swinging of the bag as you move. We love the reflective strips on this bag, also. They are visible up to 100 meters during the night, which could make this an especially fantastic bag for elderly with dementia or Alzheimer’s or who might run the risk of getting confused at night if they’re outside. Even for seniors with perfectly healthy minds, the reflective strip is a nice feature if you’re not able to move out of the way of a car quickly. Function and the items you need to carry with you will play a big part in deciding on a bag or basket for your walker or rolling walker. Naturally, everyone wants a quality-made item. However, some of these bags are designed for things such as books or magazines, where others can carry bulkier items. One of the initial things you need to consider in deciding on baskets for walkers, bags for walkers, or carry bags is what you will bring with you. Elderly who need to move bulkier items such as oxygen, for example, will need either a large tote with more secure straps or a basket so they can check oxygen levels at a glance. If you’re a senior who only needs a few small things, such as a book and a pill bottle, one of the slimmer bags might be easier to deal with. If you don’t want to shuffle through a bag to struggle to find something, and only have a few items, we recommend considering the Drive Medical Basket. Your style of a walker and its measurements will be crucial in deciding on the right bag or basket for you, also. Wide or bariatric walkers will need longer straps or attachments, such as on the Vive Rollator Bag. If you have a standard, non-rolling walker, however, a more secure basket or shorter straps will likely be better. Think about the movement of each step or lift of your walker, and considering long straps causing the bag to swing. This would become an issue for some individuals. If you have medications, credit cards, or cash that you’ll be stowing in your rollator or walker bag, you probably want more privacy like a tote affords. A basket can be excellent for moving things around and grabbing them quickly. However, if keeping your belongings out of sight from others is essential, you may want to skip past basket style and get a bag. If you or someone you’re caring for has specific conditions that increase the risk of losing consciousness, a bag with a medical alert pouch like the P & F Walker Bag is undoubtedly worth considering. If you’ve experienced a distressing situation of being outside at night, or your loved one has done so and gotten confused, we like the reflective strips on a model like the Pembrook Wheelchair Side Bag. A walker bag or walker basket can be a huge convenience in mobility for the elderly. Adding ease to moving around can increase your motivation for getting up and about, which is generally positive for your body and slowing the aging process. So, evaluate what you need to carry, your own medical conditions (if any), and then pair the best option with your specific walker size and style. If you’ve never used a walker tote or basket before, you’ll be pleasantly surprised how much handiness they can bring to everyday life.